Easily slip is the biggest complaints when using the knee pads. You will feel frustrated by needing to constantly adjust your knee pads. Vuino design the hinged knee pads which will keeping on your knees firmly. Spending hours kneeling in the garden or at work store without knee protection is a terrible experience. An extra thick gel cushion and EVA foam padding in Vuino knee pads will product your knee from hard and uneven surfaces.All the straps are double stitched to prevent rips and tears and made of neoprene. Vuino knee pads' hard plastic cap is scratch resistant and non-slip. The flat cap design is friendly for hardwood floors and other surfaces. If there's an issue with your knee pads, we'll make it right by replacing them or giving your money back. Click "Add to Cart" button and Order your Vuino Knee Pads Today! 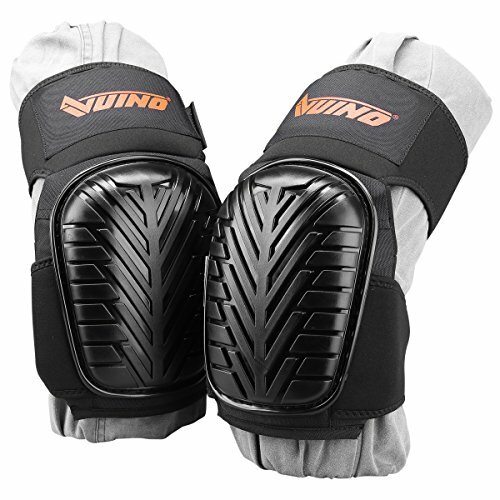 SIZE- The Vuino knee pads size: 11.5*7inch(29.5*18cm). The max size for thigh: 26inch(66cm). The max size for calf: 18.5inch(47cm). If you have any questions about this product by Ningbo Xinweinuo Fanghuyongpin Co.,Ltd, contact us by completing and submitting the form below. If you are looking for a specif part number, please include it with your message.